Georgije "Đura" Jakšić (Serbian Cyrillic: Георгије "Ђура" Јакшић, 27 July 1832 – 16 November 1878) was a Serbian poet, painter, writer, dramatist, bohemian and patriot. Georgije Jakšić was born in Srpska Crnja in Austrian Empire (today Serbia). His house has been transformed into a Memorial Museum in his honour. His early education was in Temeschwar (today Romania) and Szeged (today Republic of Hungary). 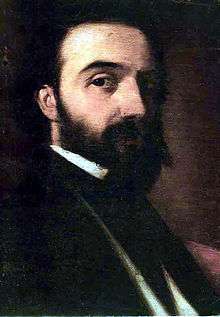 Jakšić lived for a time in Großbetschkerek (Serbian: Veliki Bečkerek, now Zrenjanin), where he began studying painting under Konstantin Danil. Jakšić, a son of a Serbian Orthodox priest, then went on to study fine arts in Vienna and Munich, but the revolution of 1848 interrupted his education, which he was never able to finish. In the 1848 Revolution he was wounded while fighting in Srbobran. After the revolution, deceived by the Austrians after the May Assembly, he came to live in Belgrade, Principality of Serbia, where he served as a schoolteacher and in various other capacities, although he was often unemployed. Jakšić's address was in Skadarska Street, the focus of the city's bohemian life and haunt of Belgrade's artists, writers, musicians and actors. He lived there and his former home is still used as a poetry venue for occasional 'Skadarlija nights'. A political liberal, he was persecuted by authorities. He died in despair and ravaged by illness in 1878, after he had taken part in the uprising against the Turks in Bosnia and Herzegovina. Jakšić abhorred the rationalism and materialism of his time. What he saw and painted were human beings beset with evil, yet shining for the divine within them: He remains one of the most beloved poets of the Serbs and the symbol of their national spirit. Jakšić is one of the most expressive representatives of Serbian Romanticism. Passionate, impetuously imaginative, emotional, rebellious and imbued with romantic nationalist sentiment, his poems about freedom, his invectives against tyranny and his verses of lyric confession resonate with romantic pathos. He saw and painted Kosovo, Battle of Montenegris, and Night Watch. Visions which will resurface in his verse little by little, here and there. Both in his poetry and paintings, the purpose of Jakšić's art was primarily moral. By showing men his vision of the possibility of true freedom of the spirit, he hoped to free them from the shackles of convention and tradition, to help them realize their potentialities by trusting their intuition. His visions were also social and political. According to Serbian literary critic Jovan Skerlić, Jakšiċ was influenced mainly by Alexander Petőfy, the great Hungarian poet of the 1848 Revolution, and Lord Byron's poetry depicting the Greek War of Independence. Jakšiċ, Skerliċ felt, was perhaps too much an artist, and would see nothing but art in anything he loved .... Here Skerliċ reveals the limitations of his disillusioned middle age (shortly before his death). Jakšiċ cannot be judged, either as an artist who meddled in mysticism, or as a mystic who employed the imagery of art. His character was entirely homogeneous; each of his pursuits was closely linked up with all his other occupations, whether he were writings lyrics, epic poems, dramatic plays, novels, publishing, making a pencil sketch of the vision that floated before his eyes, or simply painting upon canvas his magnificent portraits. It is typical of him that, besides painting and colouring his songs, he should have sung them to music. During his lifetime and after, though Jakšiċ had many admirers—they included Konstantin Danil, his former art teacher, portrait painter Katarina Ivanović, Uroš Knežević, painters Pavle Čorbanović, Jovan Popović, and Đorđe Krstić, and, among the poets and writers, Laza Kostić, Simo Matavulj, Kosta Trifković, Svetozar Miletić, Jovan Jovanović Zmaj, and Vojislav Ilić. Jakšić is one of the leaders of Serbian romanticism and one of Serbia's greatest painters in his day. Although he wrote a number of loosely organized romantic plays, his reputation rests largely on his paintings and poetry, which ranges from sonnets, lyrics, and patriotic songs to full scale epics, or, as they are sometimes called, novels in verse. His favourite theme of nature and the national cause show a clear Byronic influence. Elizabeth the Montenegrin Queen (Jelisaveta kneginja crnogorska, 1868) and the novel Warriors. Among his few poems are several that belong to the best in the Serbian poetry of the nineteenth century: Na Liparu (On the Lipar Hill), Put u Gornjak (The Road to Gornjak), Mila (This song is dedicated to his first great love, Mila, who he intended to marry, but never actually found courage to tell her a single word. She worked at her father's Inn, "The White Cross", where Đura Jakšić was regular guest. He allowed only Mila to pour his drinks, always in silence. He also drew sketches of Mila, one of them later became his famous painting "Devojka u Plavom" (Girl in Blue). The actual poem was written during short period of time that Mila spent away with her cousins. Those days seemed like ages to poet and he really thought she would never come back. He opened his heart with this poem. "…Ana toči, Ana služi, al` za Milom srce tuži…" (...Ana pours, Ana serves, but for Mila heart mourns...(Ana was Mila's sister who also worked at the Inn)), Otadzbina (Fatherland), Veče (Evening), Ponoć (Midnight). In the careers of most artists, we can trace a gradual ascent, followed very often by a slow decline. But, although he moved on from the marvelous lucidity of his early poems to the deep obscurity of his later work called Pripovetke (Storytelling), released posthumously in two volumes on two different occasions, 1882–1883 and 1912 in Belgrade. Through them he expressed his pessimism and bitterness about the harsh blows life and people had dealt him. He was both the beneficiary and the victim of the romantic spirit, in his works as well as in life. Oh, ghostly spirit! Oh, dear shadow! Oh, my mother, happy am I now! Because of people and their errors. Oh, mother, mother! Oh, dear spirit! Spider weaving o'ver the blackened ceiling! Life, oh, my mother, is full of sorrow. Jakšić, a king in heroic style, is also one of the most talented and accomplished Serbian painters of the 19th century and perhaps the most prominent representative of Romanticism in Serbian painting. Although best known for his literature and paintings, Jakšić was also a teacher and professor. Schools and colleges throughout Serbia and the rest of the former Yugoslavia still bear his name. Knaz Milan Obrenović IV etc. He is included in The 100 most prominent Serbs. Translated and adapted from Jovan Skerlić's Istorija Nove Srpske Književnosti/History of New Serbian Literature (Belegrade, 1914, 1921), pages 310-319. Wikimedia Commons has media related to Đura Jakšić.